Discussion in 'GPS Tracks - Central, Texas & Gulf States' started by Cannonshot, Jun 28, 2008. 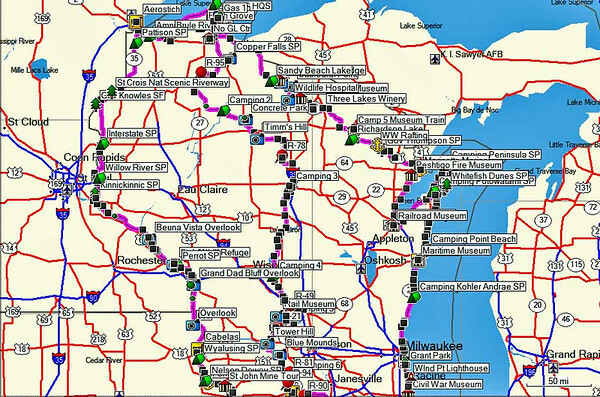 This route is primarily pavement, suitable for big adventure bikes, and might serve as an entertaining return route for anyone who rides the Trans-Wisconsin Adventure Trail. I developed the route after considering a run on the TWT and realized I didn't want to just slab it home. The route will take a minimum of two days but obviously that varies depending on how involved your sight seeing is. 33. 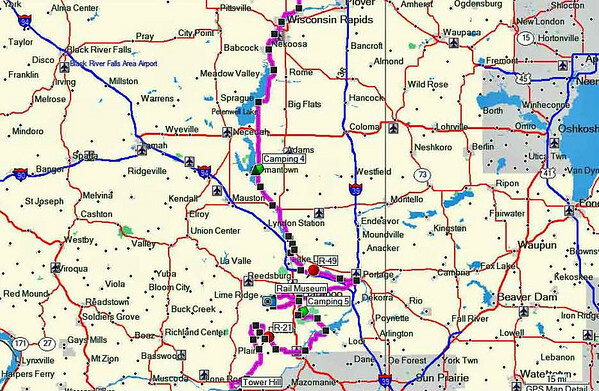 The route ends at the interstate at Beloit. I also waypointed a few potential campsites along the route. Fuel is pretty straight forward as the route runs through many towns. If you would rather have the .gdb, PM me an e-mail address and I'll send it to you. The file contains one route, twenty-four waypoints, and six tracklines of less than 250 points each. For anyone considering this as a return route after riding the TWT, here is a picture depicting the proximity of the two routes. The TWT is yellow and this route is green. 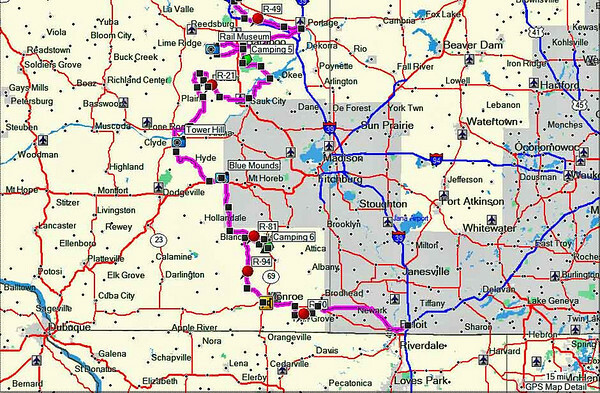 If someone wanted a 1170 mile loop, they could join either track anyplace proximate to their home, and then ride out the loop to complete both segments. One would have to map out a link from Monroe to the start of the TWT (easy deal). Very nice! I've always been in such a hurry to get back that I have just blasted out the 300 miles home in a sick slabfest, but this would be so much better. Its totally available, just email me @ chad@lonewolfexpeditions.com and I'll email it to ya. Its a gdb file that doesn't send through advrider, plus I kinda want to keep track of who has it just so I can do updates etc. 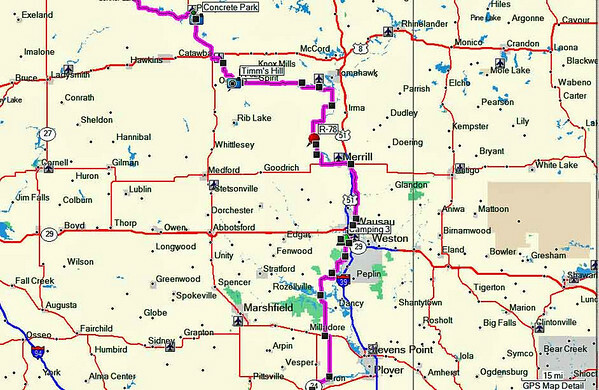 There are two other complimentary routes posted in GPS Central that could serve as return routes for big bikes. sorry for the thread jack. copper falls, worth a roll up from iowa for a night of tenting it? was just scrolling around on a map and came upon that, seems like at least somewhere to go. I think you could make a nice trip out of that. Lots to see along the way. CANNON, Thanks for fixing the GPS links. Now can you do anything about getting rid of the snow and cold weather? If I could, I would have been gone long ago.